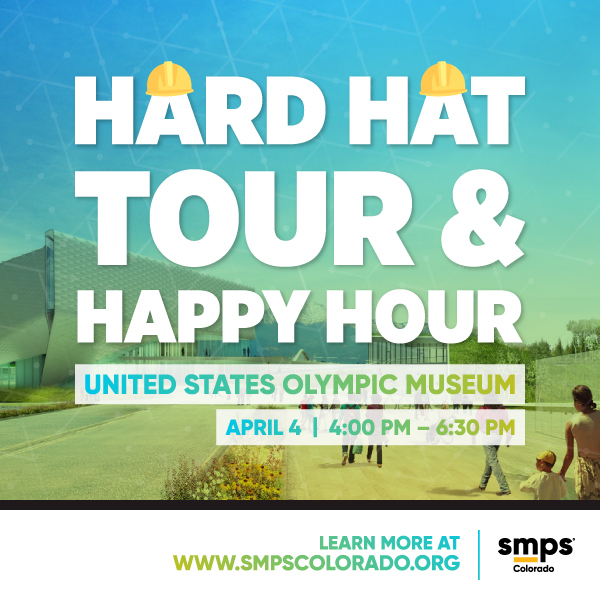 The SMPS SoCo Committee is hosting a Hard Hat Tour of the US Olympic Museum followed by a happy hour at Phantom Canyon! The museum is part of a $250 million City For Champions initiative in Colorado Springs and is intended to be the official showcase for Team USA. The four-story, 65,000-square-foot building draws its design inspiration from athletes in motion. The facility will include galleries, an auditorium, and administrative spaces wrapped around a common atrium. Once completed, the visitor experience will begin on the top floor of the museum then wind down the spiraling exhibit halls, tracing the history and legacy of U.S. Olympic history and Team USA. After the tour, we’ll head to Phantom Canyon (2 East Pikes Peak Avenue, Colorado Springs, CO 80903) for a Happy Hour. One registration includes the Hard Hat Tour as well as appetizers and one drink ticket per registrant during Happy Hour. Ticket Prices: This event is SOLD OUT.